One of the best ways to increase the overall value of your garden is to grow plants used to make good things to drink. Herb tea is a familiar concept to most of us, but the time has come to think outside the teapot. In the age of refillable personal water bottles, making tasty infused waters with herbs, berries and veggies may be your newest reason to grow a garden. First, let’s get the terminology straight. When a beverage is brewed by adding steaming hot water to assorted plants other than true tea (Camellia sinensis), it is technically a tisane. Herb teas or tisanes can be sipped for enjoyment, used medicinally, or created to be part of a menu. In comparison, thirst-quenching infused waters are brewed and consumed cold; you might think of them as the herbal counterpart to cold-brewed coffee. Many infused water recipes include both herbs and fruit, so they make water more colourful and nutritious, too. Any of the herbs you dried in summer will quickly brew into a tasty herb water. When used to make infused herb water, you can taste the bouquet from mint, parsley or basil. Dried parsley is an absolute winner here, producing a refreshing infused water with satisfying carroty notes. Oddly enough, herbs like lemon balm and catnip that make second-rate tisanes or teas make great herb waters. Adding pinches of potent dried kitchen herbs like marjoram, thyme or sage can add character to herb-infused waters, too. Among vegetables, cucumbers make a dreamy infused water, which is often paired with sprigs of mint. I also like celery water, which can even be made from celery leaves. 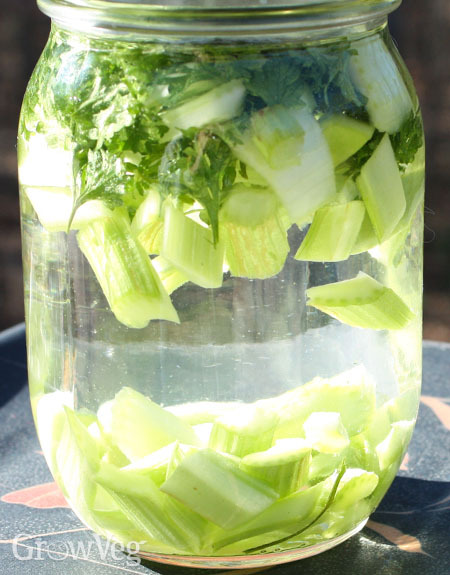 You can make a shockingly complex infused water from diced stalks of bulb fennel. Frozen berries enrich infused waters with colour, with raspberries producing light pink water compared to the smoky purple from blackberries. You won’t need but a few frozen strawberries, blueberries, currants, cranberries or bramble fruits to impart punchy flavour to infused waters. Berries that are too tart to eat straight up work especially well in flavoured waters, where their acidic compounds dilute into delightful aromatics. I can’t grow citrus fruits in my climate, but they must be included here because they are so useful in infused waters, where the rinds are the best parts. Fresh or dried, the rinds from lemons, limes and oranges make ideal flavor accents for infused waters. I like to use pint or quart canning jars with tight-fitting lids to make infused waters. After adding enough dried herbs, frozen fruits, or chopped veggies to fill the jar one-third full, I top it off with water, shake well, and let it sit at room temperature for about two hours. You also can steep infused waters overnight in the refrigerator. Minimally-processed dried herbs and frozen berries may carry microbes that flourish at warmer temperatures, so chilling is in order after the initial steeping period to prevent spoilage issues. When the steeping time is up, use the back of a spoon to smash and press the softened herbs or fruit, and then give the jar a solid shake. Pouring the mixture through a strainer will remove most of the plant material, but if the infused water is too cloudy for your taste, a paper coffee filter will remove unwanted bits. Now you get to start sipping. Expect flavours that are big and round and linger on the tongue. Most infused waters give off a light fragrance, too, which is part of the fun of making and drinking them. Get creative, try different combinations, and drink to your health.